Retail analysts and industry experts have debated for years now: Is Amazon a friend or foe to e-commerce merchants? It’s not so black and white, according to our data. Back in April in our Q1 EPIC Report, we learned only 6% felt Amazon posed less of a competitive threat to their online businesses compared to the same quarter the year before. The data revealed merchants leaned toward viewing the e-commerce giant as more foe than friend. What’s more, Amazon Prime Day’s Christmas-in-July effect had far-reaching implications even for non-Amazon retailers. Salesforce analyzed activity from 500 million online shoppers and found online sales for other retailers grew 44% on Prime Day 2017 compared with last year’s event. The same report also found non-Amazon retailers benefited from a 34% higher conversion rate compared with the day before Prime Day. Prime week also spiked mobile purchases for other retailers. Analyses done by Liftoff looked at mobile app activity during Prime week compared to the six weeks prior. According to Liftoff, “the percentage of users who installed a non-Amazon shopping app and made a purchase in the app increased by a whopping 46.76%”. It would seem Amazon is clearly friend material. But then again, maybe not. The perks of leveraging the giant come with some concern. 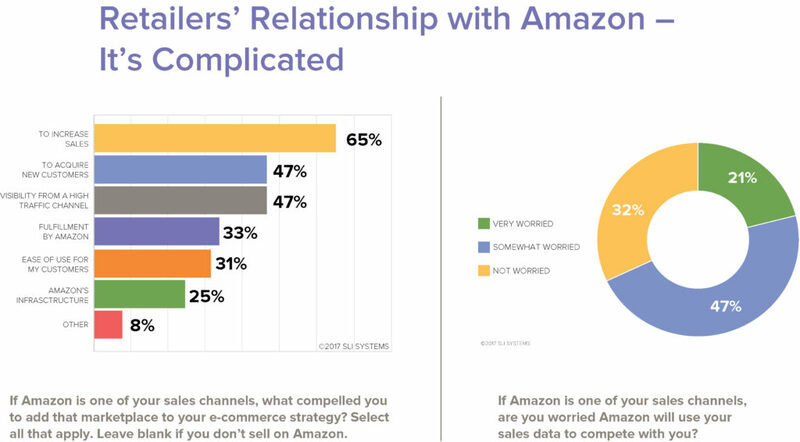 The Q2 EPIC Report also found nearly 70% of those that sell on Amazon are somewhat or very worried Amazon will use their sales data to compete with them, further highlighting this complex relationship. Recently, Amazon informed sellers of a new policy for refunds. According to CNBC, the rules for items shipped by merchants are now the same as those fulfilled by Amazon. This “will totally crush small businesses that fulfill their own orders,” a third-party seller told the major news outlet. While Amazon sellers can boost sales thanks to Amazon’s massive consumer volume, the price they pay for this access is loss of control. Amazon owns the customer. And the shopping experience is tuned to drive the most sales regardless of who the seller is. So, is Amazon a threat? Yes. Can Amazon also help you succeed? Yes. Whether you’re an Amazon friend, foe, or frenemy, the key is to develop a direct relationship with your Amazon customers so that you continue building your brand and loyal fan base. Findings in the SLI Systems EPIC Report for Q2 2017 are based on a survey conducted between May 4 – June 2, 2017. For a copy of the full chart-packed report, visit: http://sitesearch.sli-systems.com/epic-report-q2-2017.